University of Minnesota scientists say they have created a lab-grown blood vessel replacement composed of biological materials, but without living cells at implantation. The vessel, which could be used as an off-the-shelf graft for kidney dialysis patients, showed positive results in a recent study with nonhuman primates, according to the researchers. It reportedly is the first-of-its-kind nonsynthetic, decellularized graft that becomes repopulated with cells by the recipient's own cells when implanted. The grafts not only have applications in kidney dialysis but could be adapted for use as coronary and peripheral bybass blood vessels and tubular heart valves. The study (“A Completely Biological “Off-the-Shelf” Arteriovenous Graft That Recellularizes in Baboons”) is published in Science Translational Medicine. “Prosthetic arteriovenous grafts (AVGs) conventionally used for hemodialysis are associated with inferior primary patency rates and increased risk of infection compared with autogenous vein grafts. We tissue-engineered an AVG grown from neonatal human dermal fibroblasts entrapped in bovine fibrin gel that is then decellularized. This graft is both “off-the-shelf” (nonliving) and completely biological. Grafts that are 6 mm in diameter and about 15 cm in length were evaluated in a baboon model of hemodialysis access in an axillary-cephalic or axillary-brachial upper arm AVG construction procedure;” write the investigators. More than 100,000 people in the United States begin hemodialysis each year to treat kidney disease and more than 400,000 people are being treated with life-saving hemodialysis nationwide, according to the U.S. Renal Data System Annual Data Report. An arteriovenous fistula, which connects an artery to a vein in the arm, is currently the preferred mode of blood vessel access for hemodialysis. However, 30% to 50% of patients experience complications and need to connect the vein and artery using an artificial tube, called an arteriovenous graft. These artificial grafts are composed of synthetic materials that are prone to clotting, infection, and other complications. Grafts grown in the lab from cells and biological materials could cause fewer adverse reactions, but living tissues aren't stable for long-term storage and could induce an immune response unless the patient's own cells were used, both being barriers to commercialization and clinical use, notes the University of Minnesota research team. In their preclinical study, the scientists made vessel-like tubes from postnatal human skin cells that were embedded in a gel-like material made of cow fibrin, a protein involved in blood clotting. 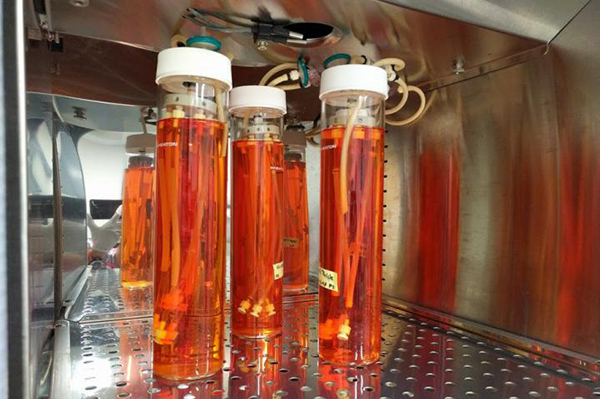 Researchers put the cell-populated gel in a bioreactor and grew the tube for seven weeks and then washed away the cells over the final week. What remained was the collagen and other proteins secreted by the cells, making an all-natural, but nonliving, tube for implantation. To test the vessels, the researchers implanted the grafts into adult baboons donated by the Mayo Clinic as it was closing down its primate facility. Six months after implantation, the grafts grossly appeared like a blood vessel, and the researchers observed healthy cells from the recipients taking up residence within the walls of the tubes. None of the grafts calcified and only one ruptured, which was attributed to inadvertent mechanical damage with handling. After six months, the grafts withstood almost 30 times the average human blood pressure without bursting, according to Dr. Tranquillo. The implants showed no immune response and resisted infection. In addition, the grafts withstood repeated needle punctures by self-healing, which would be a necessary process for patients undergoing long-term dialysis. Dr. Tranquillo’s team will seek FDA approval for clinical trials in children with pediatric heart defects since they recently reported a study in Nature Communications that this material is also capable of growing.